Every garage door relies on strong springs to support and counterbalance its weight. These are some of the most important parts of the system, which is why they must be properly cared for in order to avoid a lot of potential breakdowns. Since there is a lot of tension involved in the operation of these components, replacing them, or even just adjusting them, will require the assistance of a professional garage door technician. Even a broken spring can be dangerous to handle, so don't take any risks. Modern automatic garage door systems, and manual ones too for that matter, use one of two different types of springs. Well, technically there are some doors that may use both types simultaneously, but those are very rare examples. Let us focus on the most common implementations. Extension springs work by stretching and contracting, effectively pulling the door panels on with the latter action, via the use of directly connected lift cables. Because of the way they work, they tend to last for about half as long as their counterparts do, and can go flying across your garage when they break. That's why they are each interlaced with safety cables that serve as an anchoring wire that is meant to keep the extension spring in place in such an event. 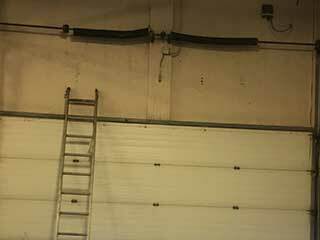 Garage door torsion springs are the more modern option, and as long as you have the required headroom to have them installed, they are usually the preferred choice. The reason for that is that they are far safer and stronger than the older type. They are more durable and flexible, as well as physically larger. They are installed horizontally above the door, and twist and unwind in order to generate the required tension. As they do, drums that are attached to them rotate and pull or lower the panels, to which they are connected via lift cables. Although they are the safer and stronger option, this type of spring needs to be maintained in order to reduce the amount of friction-based wear and tear it goes through. By regularly applying it with lubrication and letting professionals adjust its tension, you'll be able to keep using this component for seven to even ten years. Of course, when something goes wrong with either type of spring, you need to seek the help of a professional. Luckily, our experts at Garage Door Repair Fort Worth are here to take care of any spring replacement you need. Call us today for more information.